Students: If you haven't visited this Finsler-Hadwiger Action worksheet yet, be sure to do so before completing the exercises below the applet. 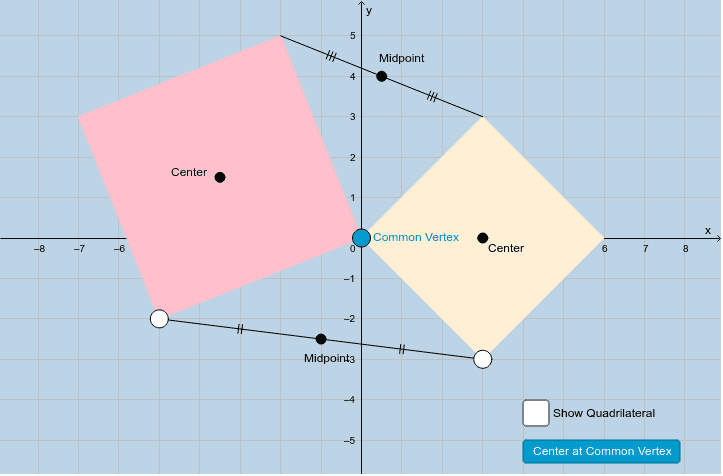 In the applet above, you'll notice two squares that share a common vertex. You can adjust the locations of this common vertex and the two white points (if you choose). The centers of these squares are shown. The midpoints of the segments that connect "nearby" vertices are also shown as well. Click on the "Show Quadrilateral" checkbox. What do you notice about this quadrilateral? Your instructor will indicate to you (and your group members) where to put the common vertex and the locations of the white points. After he/she does this, use the tools of coordinate geometry (distance, midpoint, slope) to PROVE that the green quadrilateral is INDEED what you claim it is. Do this on a separate sheet of paper. Make sure to clearly label each necessary point and be sure to label your calculations within your proof!